A unified view from planet to ground level. Limited interaction: fly around, turn layers on/off. Although the program works fairly well, there was a lack of caching - turning left then right again would cause all the data to have to be streamed down again. 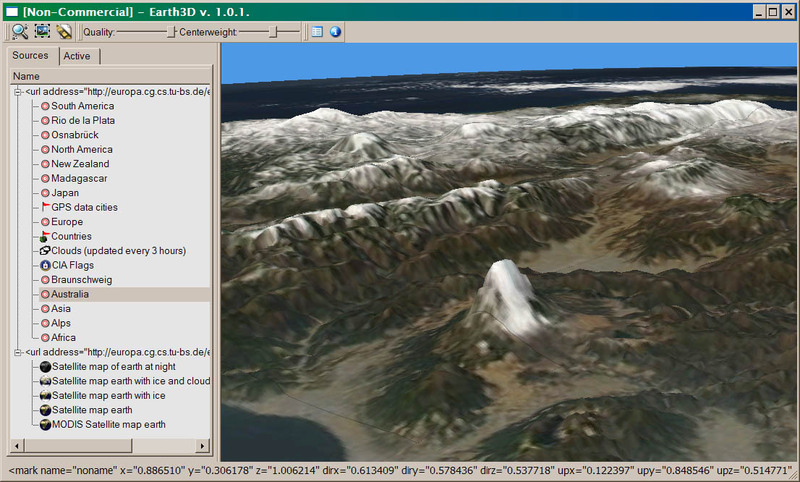 The elevation dataset was also very strange (cruder than SRTM or even GTOPO). Apparently, to view any data besides the built-in dataset, one would need to modify the code. from UK company Geomantics "The Landscape Visualization People"
2D and 3D viewing of datasets such as numerical weather prediction model output, weather satellite imagery, radar imagery, etc. 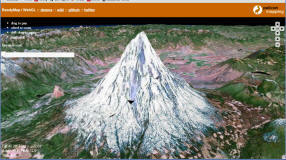 claims: "The software provides an accurate virtual representation of the real world including terrain and landmarks extracted from real geological and cartographic databases. 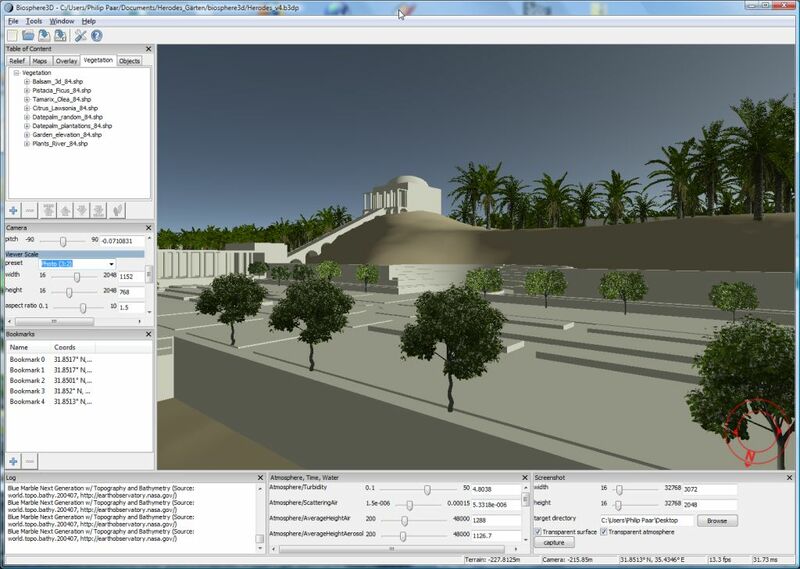 Cultural features and details such as urban areas, forests, and roads are represented graphically in 3D. 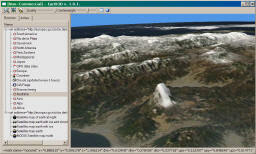 Using OpenSkies environment tools, you can also create your own custom worlds to suit your specific needs." 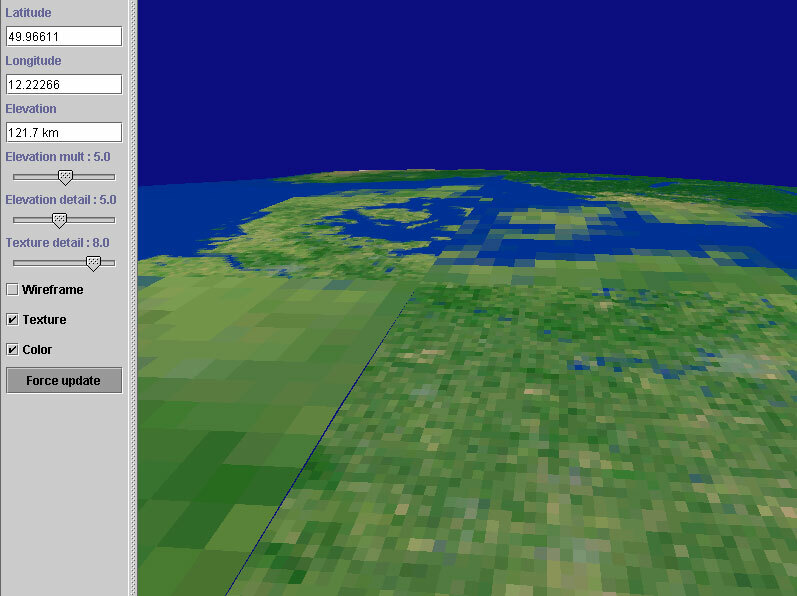 the demo had lots of bad "flashing" artifacts, and featureless, extremely low-res "terrain"
A 3D earth, based on OSG, cross-platform and open source (LGPL). Instead of OSG's rigid ive paging files, has its own ".earth" format and supports dynamic access to data source like OGC WMS. No binaries; you must build it from the C++ source. Does not appear to have a user interface. Java-based 3D application that dynamically downloads elevation (from SRTM) and rendered road network (from OpenStreetMap) for all of Europe. The main 3D content is downloaded from a Web 3D Service (W3DS). A project of the GDI3D group which previously aimed to visualize just the German city of Heidelberg. Unfortunate use of Java, painfully slow. Very large and complex, requiring a very experienced developer to build and run it. 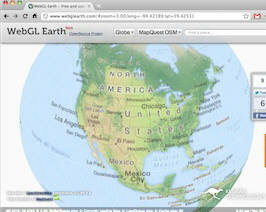 WebGL Earth (live demo) does paging of imagery sources (e.g. TMS), but not elevation, yet. The demo includes a chunk of Switzerland. An impressive WebGL implementation of a smooth, tiling, well instrumented terrain engine with a nice GUI. 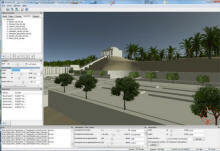 It uses geomipmaps with strips or skirts, detail textures, time of day lighting with cast shadows, and more. The issue of how to do smooth paging in JS (no multithreading) is addressed. Potree is a WebGL point-cloud viewer which can handle datasets large enough (billions of points) to describe moderate terrain areas. Includes a converter from other pointcloud formats (like LAS/LAZ) to its own format. Based on three.js. BSD license, grew out of academic work at TU Wien. As of 2012, it also did terrain with elevation. Very simple open-source (LGPL) viewer, written in Java by students at Aalborg University, Denmark. It doesn't quite handle terrain (no elevation?) but you can create scenes with building block models on top of an aerial photo (must be JPEG and CRS must be UTM). There is simple mouse navigation, and some LOD on the building models which pops a lot. there are/were actually 2 different projects by this name. "TerraVision Germany and TerraVision SRI started same exact moment in time. they met each other one day and TerraVision Germany decided to change names, in states only, to t-vision. They were both funded similar levels, couple million, and similar details etc. although each claims to be better." "a virtual representation of the whole earth as a general interface to organize, to access and to visualize any kind of information."